We said it long ago: The Apple iPad will redefine newspapers, textbooks, magazines. Were we right? Is Apple bringing a media revolution? Oh, it'll get there. We've had an iTunes store and now we've got an iBook store with content from Penguin, Harper Collins, Simon & Schuster, Macmillan, Hachette book group. We'll browse this content on a bookshelf-like page and add to it using a purchase system similar to the App store's. This interface looks clean, organized, and like you could really snuggle up with your iPad and a book—though I do wonder about eyestrain from a display like this. The pricing we're seeing for actual books during the presentation resembles what we've heard before with a price point of $14.99. Update: Some eagle-eyed readers noticed that there are several books with price points as low as $4.99 in the iBook store. While Apple uses the ePub format, we don't have confirmation about whether you can import your own books into the iBook library—though odds are in favor of that freedom. We figured that a New York Time's iPad application was coming, and while it allows for playback of video clips and other enhanced content, we're not really getting anything that we couldn't get on the NYT website. The point is that now there's not only motivation for publishers to push online or app-based subscription models, present more enhanced content, put out their own apps—just as they did for the iPhone—but now there's an device which screams that it's ideal for the job. We've seen mockups of a Sports Illustrated iPad application and that'll probably become reality soon. Right along with a properly formatted version of Wired. Sure there are plenty of movies in the iTunes store, but watching them in widescreen landscape format on the iPad leaves half the device's screen unused as. Bit tacky, but somehow I think we might overlook that considering that the iPad's battery lets us keep watching videos for ten straight hours. What's So Great About It All? Click to viewMovies, books, music, magazine and newspaper apps. 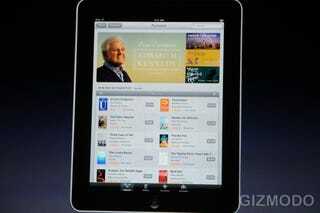 The iPad combines Apple's solid content delivery system and a device which is almost ideal for all that media. We'll listen to our iTunes collection while reading out iBook collection and squinting at the grease marks left from a popcorn-powered ten-hour movie marathon. Comic books. I desperately wanted to see the ideal comic book reader today, but that's certainly something an app could help with. There were also expectations of some kind of subscription model for some magazine and newspaper content, but it appears that we'll have to wait for the apps and see how that works out. Oh, and international users will be a bit left out with any iBook content based on the fine print explaining that "iBooks [are] available in the U.S. only," but that's probably due to Apple needing to work things out with publishers.